What is Lap Gastric Band Surgery? In some countries this is known as Lap Band Surgery and others refer to it as Gastric Band Surgery. Gastric Lap Band Surgery and Lap Gastric Band Surgery are in fact the same procedure. Lap Gastric Band Surgery is a common type of weight loss (Bariatric) surgery. Lap Band Surgery is performed laparoscopically under general anaesthetic and takes between 30-60 minutes. 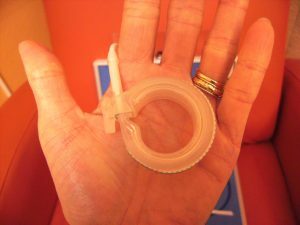 The Gastric Band or Gastric Lap Band Surgery works on a similar principle to a cable tie. The surgeon wraps the band around the outside of the stomach and clicks it into place, which creates a small, golf ball-sized pouch in the upper part of the stomach. When the person eats, the food collects in the pouch before slowly passing through a narrow opening into the lower, main part of the stomach. The amount of food that you can consume is drastically reduced, which helps with weight loss. The band is hollow and has a tube with a port connected to it. It can be adjusted by injecting saline fluid into the port. Read more information on the BUPA website. After the band is fitted, patients have to live on liquidised foods and soups – for up to about six weeks. After your first band ‘fill’, you slowly re-introduce solid foods and start the strict diet, which you have to follow for ever. 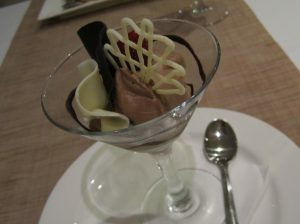 BOSPA explains the various stages of the gastric band post-op diet plan in detail. and ice-cream will pass through the band very easily! According to the Obesity Action Coalition website, gastric band patients on average only lose around 50% of their excess weight. So, basically, if you currently weigh 250 pounds and your ideal weight is 150 pounds, (making you 100 pounds overweight), then you would, realistically, only expect to lose around 50 pounds after gastric band surgery, which means that you would actually still be 50 pounds overweight! As with all surgical procedures, Gastric Band Surgery or Gastric Lap Band Surgery carries certain risks and has potential side effects and complications, which are outlined in detail on the NHS website. So how safe is it? Well, studies have shown that around 40% of people who have Lap Band Surgery suffer from some sort of major complication! For further information, click here. For ease of reading on this page we have grouped together the often used search terms for Gastric Band Surgery – Lap Band Surgery, Gastric Lap Band Surgery and Lap Gastric Band Surgery. One lady’s horror story is related in detail in The Daily Mail. 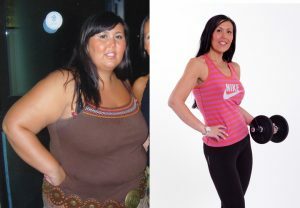 Sarah lost half her body weight following her GMB treatment. The approach has been featured on National television on both sides of the Atlantic, and is now the subject of a book, The Gastric Mind Band, published by Hay House. Before you make your final decision view www.gmband.com, read the case studies, check out the before and after features, and if you’re still not convinced, read the independent reviews of journalists that have visited the clinic themselves. Finally if you have any doubts email the clinic and request a non obligatory telephone consultation with one of the team. You have nothing to lose, other than weight of course! But first, if you still have doubts, why not ‘Try it Before You Buy it’. We recently recorded a one hour MP3 audio file, which contains a full introduction of the GMB treatment by Martin and Marion Shirran and includes a studio-produced full GMB Hypnotherapy Session, it will hopefully demonstrate to you how with the GMB treatment you really can achieve the Permanent Weight Loss you desire. The MP3 download costs just £9.95, which is fully refundable should you at any time within six months of purchase decide to undertake the GMB treatment in any format. You can read more information and if you wish download the file here.